I opened my “eyes.” I was a baby dakotaraptor striding behind my parents with my siblings, like a flock of ducks. My parents would hunt and provide for me, I thought. Nurture me until I was strong enough to fend for myself. Maybe even love me, in their own simplistic dinosaur way. About a minute later, I stood, slack-jawed, as a larger raptor tore them to pieces while my brothers, sisters, and I watched. 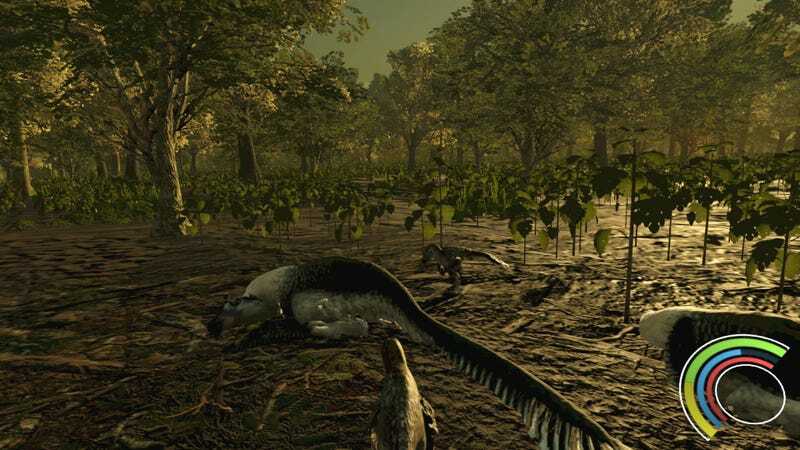 Saurian is a single-player dinosaur survival game that’s basically the polar opposite of Ark: Survival Evolved and its ilk. There are no humans (or giant wolves or spiders or dragons), and the developers claim that“every animal and plant has been rigorously researched to be accurate to currently accepted knowledge” with the help of professional paleontologists. It’s certainly a refreshing change of pace in a scene overstuffed with survival games that aren’t actually about survival, but it’s also pretty barebones at this point. And by “realized,” I mean a juvenile raptor only slightly bigger than me tackled my starving form to the ground and killed me with a single bite. I take solace in the fact that I probably wasn’t a very filling meal. The first time I spawned into the game as a baby dakotaraptor (the only playable species, as of now), I bolted away from my parents. It didn’t end well. I only needed to make sure my hunger and thirst meters were topped off, but I struggled to find a source of water, and when I finally did, I realized I wasn’t big or capable enough to hunt other dinosaurs for food. And by “realized,” I mean a juvenile raptor only slightly bigger than me tackled my starving form to the ground and killed me with a single bite. I take solace in the fact that I probably wasn’t a very filling meal. The second time I spawned in, I decided to cling to my parents like my life depended on it, because it evidently did. We walked through the untamed forests, a prehistoric familial unit bound by instinct and the will to survive. I felt protected and provided for, if not cared about. The sun peeked through the trees, giving the moment an almost idyllic feel. Then the whole incident where my parents got torn to shreds happened. At first, I was just shocked. In real life, my mouth hung open for a solid ten seconds after the larger raptor did its thing and then sauntered away, seemingly not hungry enough for a “family size” dinner after all. Then I was kinda amazed. The whole moment, after all, was unscripted. The game gave me this wild emotional roller coaster ride in the span of a couple minutes. Quite an accomplishment! That’s when I noticed that one of my siblings was standing near one of our parents’ corpses and sorta nudging at it. “How heartbreaking,” I said to myself. “They ain’t getting up, friend. We’ve gotta move on.” Then I realized my sibling wasn’t mourning at all. They were actually eating dear old mom and dad. I should’ve been astonished, but dinosaur life has a way of inoculating you to life’s little horrors—for example, cannibalism of one’s own parents—rather quickly. So I sidled up to our parents’ still-warm corpses and began chomping away. Then I went to sleep. I should’ve been astonished, but dinosaur life has a way of inoculating you to life’s little horrors—for example, cannibalism of one’s own parents—rather quickly. The next in-game morning, I awoke to an odd sight. My siblings were nowhere to be found, and when I approached my parents’ corpses, they suddenly disappeared. “Welp,” I figured, “guess I’ve gotta go find a new source of food.” I journeyed through hot forests and sloping plains, hoping to happen upon a body of water. I didn’t have much luck on that front, but I realized I could hit the E key to engage my sense of “smell,” which allowed me to spot tiny lizards scampering around, providing me with precious scraps of food. Dehydrated and nearly blinded by the dark of night, I eventually found a tiny oasis with a reasonably large lake in the middle. It should’ve been my moment of triumph, but sadly, that’s when things started to fall apart. Many dinosaurs, you see, congregated around this watering hole, often getting into fights. Inevitably, that’d create at least one body, which I could munch on after the winning raptor, triceratops, or what have you walked away. A T-Rex. It literally never left that spot. My needs entirely met, I didn’t really have a ton to do. After a couple in-game days, my baby dinosaur grew into a slightly larger (but not yet full-grown) juvenile, but I still wasn’t ready to battle any prey. I took to passing the time by watching other dinosaurs, only to realize they were pretty dumb. Many sorta just wandered around in circles, and when I finally encountered a tyrannosaurus rex—a rare and awe-inspiring sight—it almost immediately got stuck on a tree and proceeded to never move again. As is, Saurian offers some cool moments, but it’s glaringly incomplete. Also, while the game’s dinosaur species might’ve been meticulously researched, it doesn’t mean a whole lot if their AI glitches out more often than it does anything interesting or exciting. On the upside, the developers acknowledge that there’s still a lot more work to be done and plan to implement multiple life stages for four different kinds of playable dinosaurs as well as “complete” AI and foliage species. On the downside, they say it’ll probably take two years of early access to accomplish that. As wild as my first moments in Saurian were, I’m gonna have to recommend that you hold off on buying it until it’s further along. It’s got a lot of potential, but much like my in-game parents, it just doesn’t have enough meat on its bones.